The Smith and Wesson M&P range of pistols are great weapons. Developed specifically for military and police (hence the “M&P”), they combine advanced features with compact design. This has made them phenomenally successful amongst civilian owners also, who especially prize their light weight. If you’ve invested in an M&P, it’s worth getting a similarly advanced holster to carry it in. No matter which variant you are carrying, a decent holster can help you get the best from your weapon, add value to your gun and improve your marksmanship. The sheer popularity of the M&P creates a bit of a problem when choosing a holster. There are literally hundreds of holsters available for your gun, and choosing the perfect one can be a real challenge. Luckily, I’ve looked into it for you. After reading hundreds of reviews, talking to loads of people who take their M&Ps really seriously, and trawling through seemingly endless forums full of people discussing the pros and cons of various MP holsters, I think I finally know which holster you should buy for your M&P. In my humble opinion, you should get the CYA Supply Company M&P Shield IWB Holster. If you’ve got an M&P Shield in either the 9mm or 40 cal variant – the most popular amongst us gun enthusiasts – this holster offers all the features you would expect in a premium holster. As long as your draw technique is correct, this holster offers a smooth and fast draw. The unique design used here reduces the friction between your weapon and the holster to an absolute minimum, meaning that your weapon slides out of the holster with the minimum of fuss. This does not mean, however, that you are sacrificing weapon security. The Boltaron polymer used in this holster – a material similar to Kydex, and sharing all its advantages – is incredibly hard wearing, and will protect your M&P very well. It is molded specifically for your variant of M&P, and covers the trigger mechanism really well, decreasing the likelihood of accidental discharge. 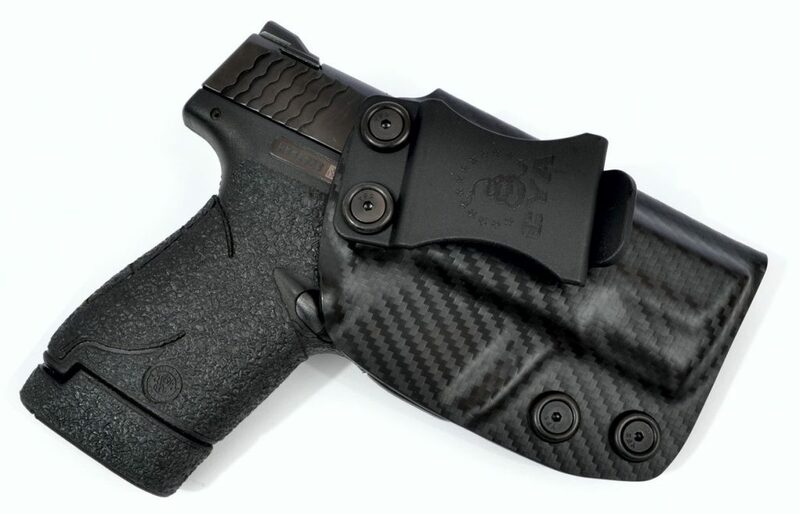 2 The CYA Supply Company IWB Holster – Is It For You? Our review process is designed to find the very best holsters and gun accessories. In order to do this, we draw on the experience and expertise of the whole gun community. The process for reviews like this starts with you. Before even considering which holsters to buy and test, we spend many hours trawling through forums, and reading reviews written by people who actually own and use these holsters. In this way, we are able to cut through the marketing talk, and find which holsters actually work on a day to day basis. We then order a batch of holsters, and test them. Nothing can replace this hands-on experience of the holsters we recommend, because until you have carried a holster around all day you simply do not know whether it is comfortable or not. We pride ourselves on the rigour we put into our reviews, and so you can be sure that our recommendations are being made by people who are as passionate about their M&Ps as you are! The CYA Supply Company IWB Holster – Is It For You? I think so. Given the huge range of holsters available for the M&P, it was very difficult coming up with this list. However, we think that this holster offers the best compromise between weapon retention and draw speed, and all at a price that puts it within reach of amateur users. That said, this holster is not for everyone, and there are a few groups who will find that this holster does not allow them to use their M&P in the way they would want. First, it is an IWB holster. Here at GND, we are fully aware of the long and complex debate over the merits of IWB vs. OWB holsters. In my mind, each has their advantages, though I know that OWB enthusiasts prize that configuration for the extra adaptability it often provides. If that sounds like you, this is not the holster to get for your M&P. Similarly, if you are really keen on concealed carry, this is not the best holster to go for. Don’t get me wrong – this holster offers a really good level of concealment for most people, but note that it is definitely not the tiny pouch preferred by concealed carry enthusiasts. That said, I hardly ever recommend that kind of minimal holster, because I think that unless you are an experienced weapon handler, they can be dangerous. 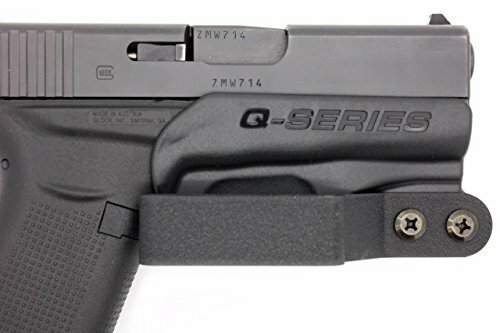 So, in short, if this holster fits your M&P, you want a good mix of security and concealment, and prefer to carry your pistol IWB, go for this holster. In my opinion, the CYA M&P IWB Holster is simply the best value holster available for your M&P at the moment. The Boltaron construction means that it is very hardwearing, and will protect your weapon for years to come. Secondly, and as I have mentioned above, the draw on this holster is super fast. Whilst the draw on any holster is more dependent on practice than on the holster itself, the reduced friction on this holster means it doesn’t hold on to your weapon unnecessarily. The adjustable cant is a feature that is normally only found on much more expensive holsters, and means that you can set up this holster exactly how you want it. The fit, on every variant of M&P we tested this holster with, was very good. The casing is molded around every part of your handgun, even the slide release and safety, meaning that no matter what you are doing your gun will stay secure. The holster is not the absolute best in terms of concealment, just because it is not the smallest holster we tested. When wearing a light shirt, you might find it difficult to hide this holster. Overall, in my opinion this is the best value holster for M&P pistols around at the moment. The weapon fit is great, the draw is fast, and I’m confident the holster will last for years. This holster comes highly recommended. Choosing a winner for this review was very difficult, not least because this Blade Tech Industries holster is also an amazing product. It offers a few more adjustments than the CYA holster above, and is only second because most casual users will not need these. If, however, you want a holster that can be carried on your belt or with a paddle, and offers adjustable cant and retention, this is the one to go for. The injection molded polymer used here is extremely rigid, ensuring that the holster stays in precisely the correct shape, even after years of heavy use. The 3 position paddle, allowing for a range of carrying styles, is also perfect if you prefer a slightly unusual carrying configuration, use your gun in a few different situations, or share it with someone else. There is no dedicated locking mechanism on this holster, which some professional users might worry about. However, if you are an experienced civilian gun owner this would not be a huge problem. In general, this is a great holster, and only held from the top spot in this review because not many people will need all the adaptability this holster offers. However, if you are serious about carrying and using your M&P in a variety of situations, and want the maximum possible flexibility, this is the holster to go for. The Blackhawk SERPA is a serious holster, and is a good choice for those who use their M&P in a professional capacity. This is primarily because in comparison to the other holsters we are reviewing today, it comes with a dedicated SERPA locking system. Though it takes a bit of getting used to, this system locks your gun securely in the holster, releasing it when you push the gun straight down. This is simply the most secure way to hold your M&P, and so if weapon security is your priority when choosing a holster, go for this one. The SERPA system, in addition to keeping your weapon secure, also reinforces good drawing technique, so you will be able to train yourself out of that weird draw style you’ve developed over the years! Well, the price. This kind of Level 2 retention holster generally costs a bit more than more minimal designs, but to my mind is worth it for the extra weapon security. 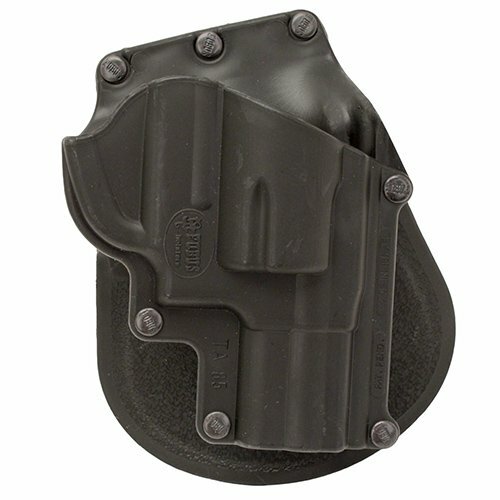 If you are using your M&P professionally, this would be my recommended holster. The extra security it offers means that you can rely on it even in the most dangerous situations. For the rest of us, this holster offers a superior experience at a reasonable price. If you are looking for versatility, this is the holster to go for. 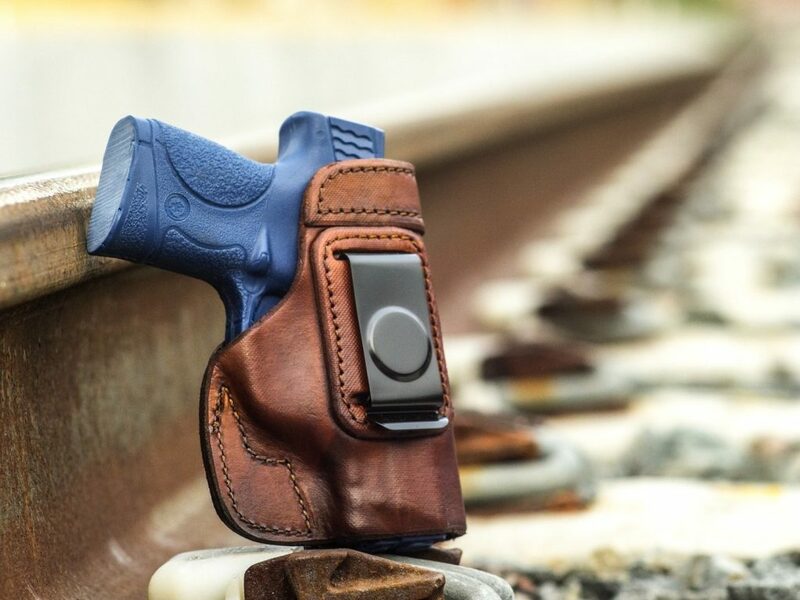 The same holster can be used in a variety of different carrying configurations, and this is achieved in a more compact design than some other holsters. 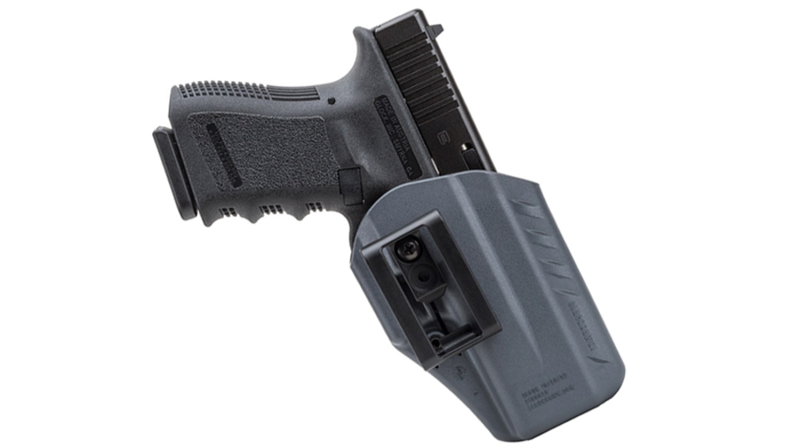 The retention, cant, and ride height can all be adjusted by pairing this holster with the included belt clips. This means it achieves the flexibility of more expensive “tactical” holsters without being too bulky or expensive. Unusually, this holster allows you to use rear mounted red dots even when your gun is in the holster. If your have aftermarket accessories mounted on your M&P, this gives it a slight edge over the competition. The draw is actually really good for a reasonably inexpensive holster. The variation in ride height also means that whatever draw style you prefer you can achieve a lightning-fast response with this holster. 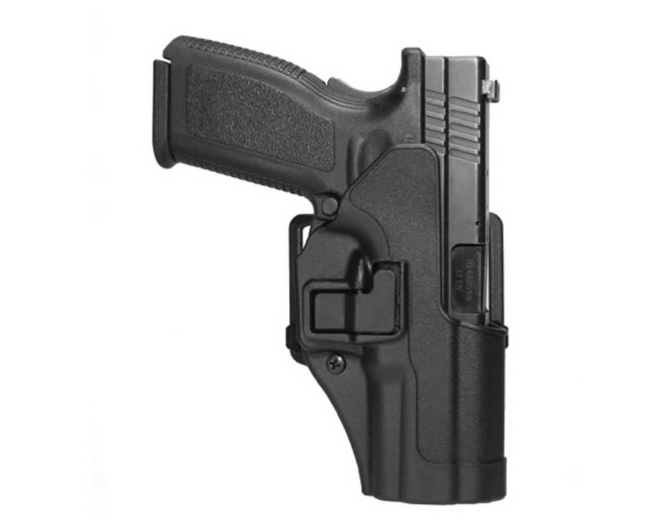 With the M&P Shield, this holster does not cover the slide. Whilst not a hige problem, this means that the slide will be against your body when carrying the Sheild, and this can be a little uncomfortable. If you want a holster with the maximum flexibility, this is the one. If you like to carry your M&P in a variety of positions, or if you share it with your partner, this holster allows for quick and easy adjustment in every respect that matters, without resulting in a bulky item. The Outbags LOB3S is best IWB leather holster we tested for the M&P. For those who prefer the look and feel of a genuine leather holster, this is a great choice. 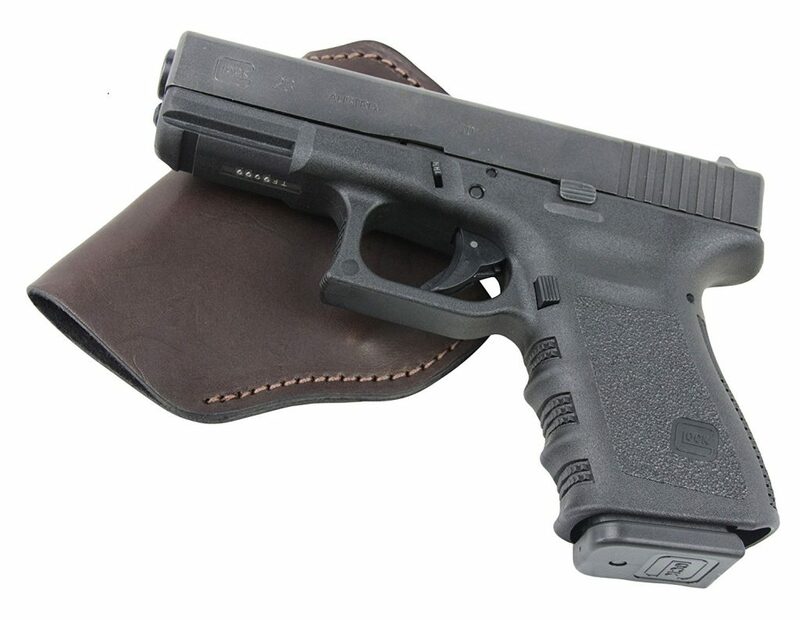 If you are lucky enough to live in a hot part of the country, having a leather holster has advantages in terms of concealment and comfort, and this holster doesn’t disappoint in those areas. Similarly, many people prefer the close carrying configuration of an IWB holster, and because this item molds itself to your body, it keeps your M&P close and stable. The leather used here is a joy. Hand dyed to preserve the natural characteristics, it simply feels better than most nylon holsters, and will (I assume!) last a lifetime. For such a small holster, this one feels very secure when clipped on. No doubt this is due to the sturdy belt clip, which holds the holster well even when you have a bulky M&P variant strapped to you. Overall, a great holster, and only this far down the list because it lacks some of the adaptability of more expensive holsters. However, if you are looking for a no-nonsense holster for your M&P, and are experienced when it comes to using and carrying it, this is a good holster, especially in terms of concealment. I’m a real fan of Concealment Express holsters, and their stylish Kydex IWB model does not disappoint. Custom molded to your M&P, including the trigger guard, it represents an excellent compromise between concealment and protection. In addition, the “posi-click” retention system is a design I wish was available on more holsters for the M&P. When you holster your weapon, the audible noise means you can be sure it is safely held in the holster. 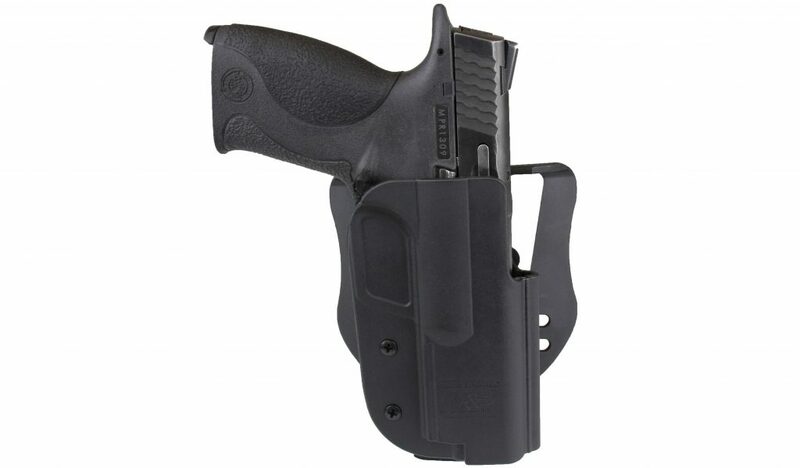 This holster has, as you would expect at this price point, fully and easily adjustable cant and retention pressure. Many professional users rely on these features, and so for this reason alone this holster comes highly recommended for serious users. The Kydex construction used here offers all the advantages of that material – incredibly rugged, and offering a nice level of friction against your weapon. It holds your M&P really well, whilst also allowing you to draw it pretty quickly. The casing of this holster does not cover the magazine release on your M&P. This means that, if you are not careful, it is possible to accidentally release the magazine. Though this did not happen in our tests, several people noted that it could be a problem. A great all-round holster that offers a few more features than it’s price would lead you to believe. This is about the minimum level of protection I would recommend for professional M&P users, and for the rest of us offers a professional experience at a good price. The only reason the popular Cloak Tuck 3.0 holster is so far down the list is because it is a little more expensive than the other holsters we tested. That said, it still represents good value because it manages to pack in a load of amazing features. Primarily, the ride height, cant and retention are all adjustable, giving the maximum possible flexibility. This would also be the holster I would recommend if you are going to use your M&P in competition, because these adjustments allow you to achieve those split-second gains that make all the difference. This is perhaps the best holster we tested, and only falls down because of the price. If money is no object to you, get this one. It is especially good if you use your M&P in competition, or if you merely like to carry your weapon in an unusual configuration. You may have seen this kind of minimal stealth holster becoming more prevalent in recent years, and the reason for this is simple – if you are looking for the maximum possible concealment for your M&P, then the Q-Series Stealth is a great solution. Whilst I explicitly DO NOT recommend this kind of holster for inexperienced gun owners, the extremely low-profile design does mean that, if you know what you are doing, you can hide your weapon whilst wearing the thinnest of clothing. It might be surprising, given the very minimal design of this holster, but it actually holds even quite bulky firearms pretty securely. The belt clip is slightly bigger than your standard item, and as a result feels stable. Another surprising feature is that the holster actually covers the trigger mechanism on your M&P almost entirely, meaning that it’s pretty hard to shoot yourself, even when drawing from the deepest concealment. Well, there is a distinct lack of protection for your gun. If you’re going out hunting, this could mean that your M&P can get damaged pretty easily. 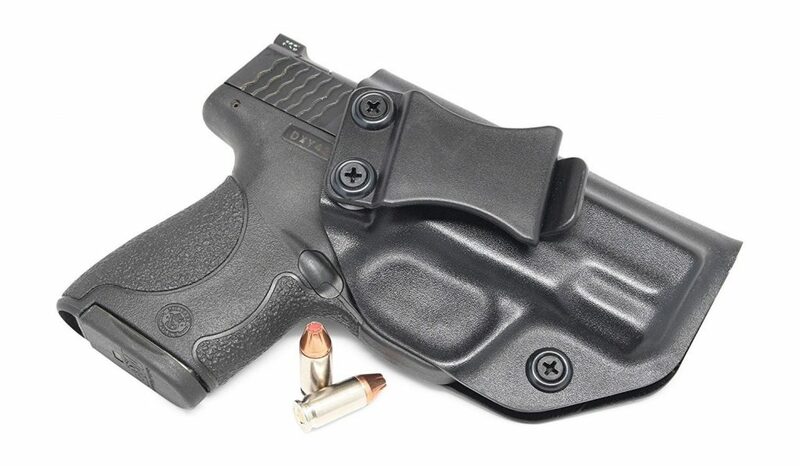 This is a holster for more advanced users who are looking for the maximum possible concealment. If you want the smoothest draw, or the most protection for your M&P, look elsewhere. However, if you really want to hide your weapon with an incredibly minimal holster, this is a great option. If you are a fan of real, all-natural leather holsters, then The Defender by Relentless Tactical is a great choice of holster for your M&P. Though not specifically molded to your particular weapon, the leather is flexible enough to form a good fit, and as with any leather holster this fit will only get better as you use the holster. In terms of concealment, this holster is also good. The leather is sturdy enough to protect your weapon, but also flexible enough to sit close to your body. If you’ve got this tucked into a gunbelt, and are wearing thick trousers, no-one will know you are packing. The build quality here is second to none, as with any Relentless holster. The people I spoke to for this review reported that these holsters will last for years. Because this holster is designed to fit a variety of guns, if you have an unusual M&P variant which you are finding it difficult to find a good holster for, this could be a good choice. Call the guys at Relentless, describe your gun, and I’m sure they’ll have a holster for you. Because this is a leather holster, it does not have the dedicated locking mechanism of some of the polymer holsters I’m reviewing today. If you use your M&P in a professional capacity, this could be a problem, but for the rest of us this is a good choice for a basic, concealed carry holster. This is the holster to get for your M&P if you want a pretty basic, leather holster. The fit, on the guns we tried it with, is tight and secure, and this will only get better with time as you wear in the leather. It holds your gun close to your body, is excellent in terms of concealment, and comfortable to wear. Whilst this is last on my list today, that does not mean it’s a bad holster. A few years ago, this kind of polymer holster was the standard against which other holsters would be measured, and this one only falls down due to the advanced materials and flexibility of some more modern holsters. The basic design actually has some advantages, also. This is a really lightweight holster, but also completely encloses the muzzle of your gun, down to the trigger guard. 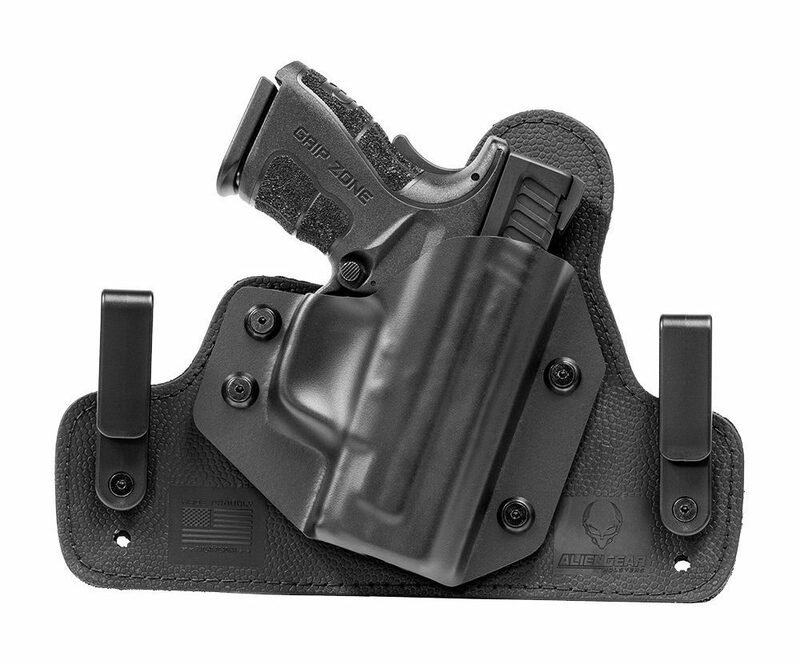 If you want a back-up holster that does the basics well, this is a good choice. The lifetime warranty is a nice feature, offered on all Fobus products. Whilst I’m not sure you’ll need it with the tough polymer used here, it’s nice to know you can return the holster in the unlikely event that you break it. Unlike almost all the other holsters for the M&P, this is a paddle design. Whilst I am not personally a fan of this design, I know that some people prefer their holster to be secured in this way. If you prefer paddle designs, this is one of the best holsters available for your M&P. Well, in truth the polymer used here feels a bit cheap. It also tends to make you sweat. On the other hand, the low friction it creates with your M&P means that the draw on this holster is fast. If you are looking for a paddle holster that does all the basics well, this is a good option. It holds your M&P securely, protecting both you and the gun. Whilst not the most luxurious of items, this is a pretty good, basic, lightweight holster for everyday use. Will these holsters fit my M&P? This is a very difficult question to answer, because of the numerous variants M&P pistols come in. The best approach, to my mind, is to phone the manufacturer of the holster you want to buy, and check directly. This is especially true if you have an unusual gun, or have fitted aftermarket accessories. Most likely, no. If you’ve got aftermarket accessories like these fitted to your M&P, you won’t be able to carry them attached to your gun. I know this is a disappointment to some people, but ultimately you should look for a holster that holds your weapon really well on an everyday basis, and save your advanced accessories for the range. No review can ever please everyone, because we all have different needs in a holster. That said, today I have tried to find a range of holsters that will suit most people’s needs. Each of the holsters above is great in its own way, and offers good value for the price it retails at. However, there has to be a winner, and in my opinion if you are looking for a holster for your M&P at the moment, you should get the CYA Supply Company M&P Shield IWB Holster. If you’ve got an M&P Shield in either the 9mm or 40 cal variant – the most popular amongst us gun enthusiasts – this holster is a great all-round product. Offering the concealment properties of many smaller holsters, whilst still retaining a pretty quick draw speed, this holster offers the best of both worlds. Add to this the variable cant, which is a feature normally only found on much more expensive, OWB, tactical holsters, and you have a fully featured holster at a budget price. In short, if you are looking for the best all-round holster for your M&P at the moment, this is the one to go for.